For the second this week, on consecutive days, traffic in the Greater Metropolitan Area (GAM) also called the Central Valley, got complicated due to early morning traffic accidents. Thursday morning, near the Cariari, the driver of a passenger vehicle lost control, slamming into the concrete divider, losing his life and sent his passenger to the hospital in critical condition. The accident occurred around 1:00 am, forcing the closure of the autopista General Cañas in the San Jose – Alajuela direction for hours. Making matters worse was the slow response by judicial officials – a judge and prosecutor – required at the scene of an accident when there is a fatality. The officials did not arrive at the scene until after 6:00 am, causing many to demand reforms. Friday morning, though both drivers survived the crash, two laden tractor trailers collided head-on on the Ruta 27 in the area of Escobal de Atenas. The force of the impact caused the cab of one of the trucks to light up a fireball. A cloud of black smoke could be seen from the air, from planes coming in for a landing at the San Jose airport. 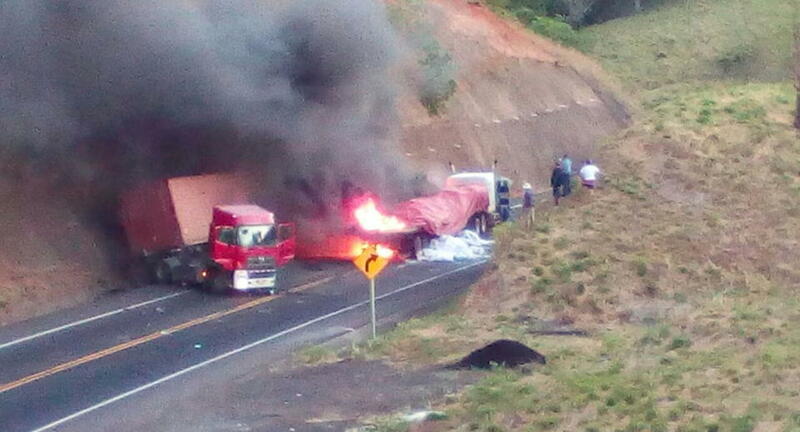 The crash occurred around 5:30 am and forced the complete closure of the Ruta 27 at kilometer 41 for hours while investigators pieced together what had occurred and allowing for time to put out the fire, unload the trucks and clear the road of debris. One of the drivers was taken to the hospital, the other, unhurt, remained at the scene. Traffic Caldera bound on the Ruta 27 is chaotic, backing up for kilometers. Authorities said fatigue could have been the cause of the accident, the driver of the truck with a full load of cement bags, headed for San Jose, crossed the median and collided with an oncoming tractor-trailer on its way to Caldera. The driver of the cement bag loaded truck, who was taken to the Atenas medical clinic, was coming from Guanacaste and headed for the Limon port. At 7:15 am, the Policia de Transito opened one lane to through traffic, it wasn’t until mid-day that traffic conditions began to normalize on the Ruta. See the video posted on Facebook. Want to keep on top of the accidents occuring daily on Costa Rica’s roads? Check out Accidentes de Costa Rica and Ruta Alterna. The website Camarasviales.com offers live traffic conditions on roads in the greater San Jose area.